We gather to give thanks and praise to God and to be refreshed, refilled, and equipped. 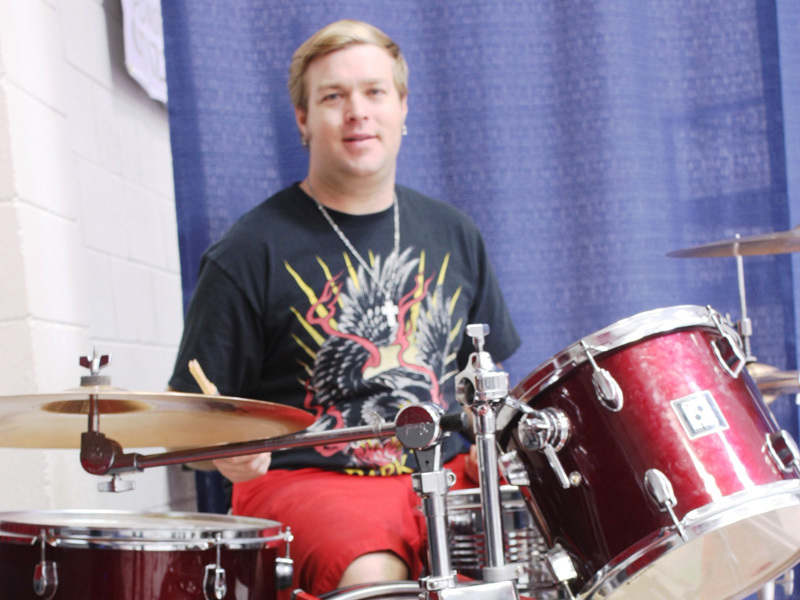 You will enjoy our service led by amazing musicians. We celebrate community and welcome families, children, young and old. Dress is casual. So come as you are! 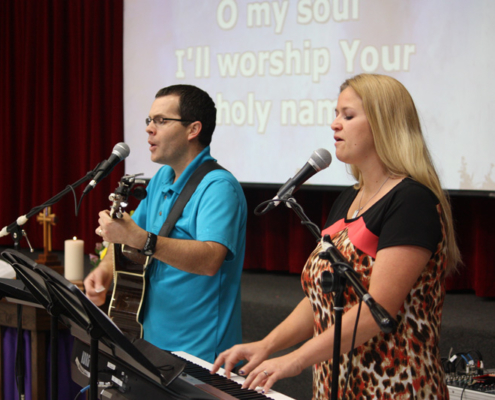 Our gatherings are designed to lead people into authentic worship of God. Prayer, Scripture and God’s Word are at the heart of our time. Children’s time is a special moment in the service followed by Sunday school. Join us as we are refreshed, renewed, and empowered by Christ to make a difference in our communities. Below are a few frequently asked questions and answers. If you do not see the answer to your question, please feel free to contact Pastor Valerie. We meet in Vistancia Elementary School so there is plenty of available parking. Our signs will direct you into the closest parking and into the meeting space. What happens when I come into the Sunday gathering? When you arrive you will find people talking and visiting and enjoying coffee. You’ll be invited to join in the fellowship. We have name tags available and encourage you to wear one. We invite you to sign our guest book. Including your email will make it possible for us to send you our weekly e-newsletter so that you can learn more about us. You can unsubscribe at any time with no hassle. We enjoy a great fellowship time with coffee and goodies after the service. We hope you’ll join us during this time. Spirit Song appreciates and welcomes children. Nursery care is available for infants to two or you are welcome to keep your child with you. During the service children are invited to participate in the opening singing and a special children’s time. Following Children’s Time we invite the children to Sunday school: Jesus Kids, 3 years to K; God’s Squad, 1st and 2nd; Middle Grade Madness, 3rd to 6th. Our teens meet after worship at 10:15. We are kid friendly. One of the nice things about meeting in a school gym is there is plenty of space for little ones who like walking around in back or enjoy playing on the floor mat provided. What happens in worship? What can I expect? 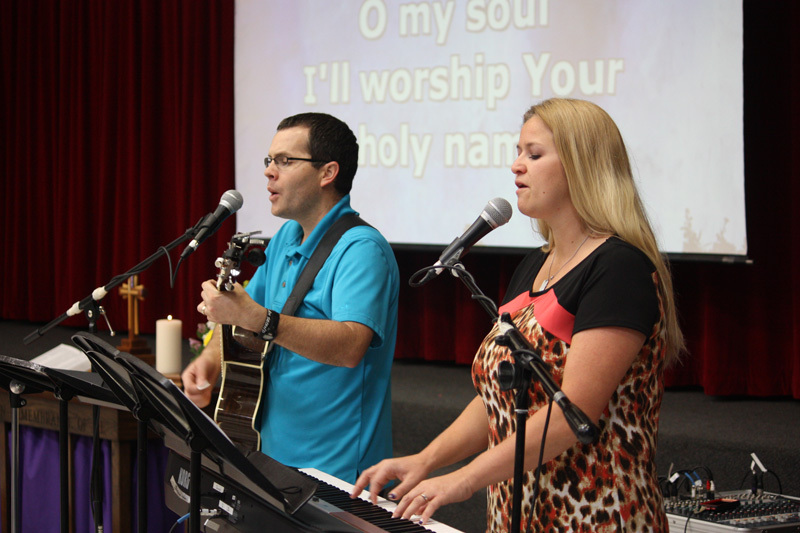 Our praise band invites us to stand and sing a few praise songs and open with prayer. 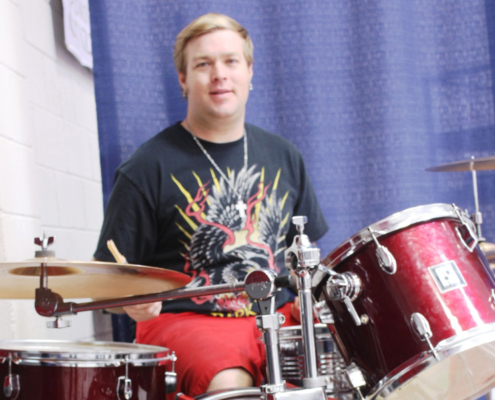 There is a special Children’s Time, a time for prayer, and another praise song. The scripture for the day is read and a message is given by our pastor followed by a final praise song.Following the message is the offering. As a guest you need not feel obligated to participate in the offering unless you wish to contribute to the ministries of Spirit Song. Our service is a gift for you. We invite you to fill out the ‘Communication Card’ and place it in the offering plate as it is passed. Occasionally there are special moments included in the service. These include: Children singing and playing bells, someone sharing about a ministry opportunity, new members joining, a baptism, etc These are great celebrations. We offer Holy Communion every Sunday. Communion in our church is not denominationally based. We believe the communion table is the Lord’s Table of Grace and it is Jesus who invites you to participate so all are welcome. You receive a piece of the bread and be invited to dip it in the grape juice and take the two elements together as symbols of Christ’s offering for us. You need not participate if you do not choose but you are welcome. What happens after I visit? If you left an email address you’ll receive our weekly e-newsletter to help you learn more about us. (You can click unsubscribe if you do not wish to receive it.) You may wish to check out the website again as you are today. If you left your address you’ll receive a thank you card for joining us.We have two intentions with followup. We want to give you the opportunity to ask questions and we want you to know we hope you’ll come again. In addition, we are interested in hearing about your experience with us because we are always seeking to be extravagantly hospitable. Yes. Everything is on one level, the doorways are wide and their are handicap stalls in the rest rooms. If hearing is a challenge, sit forward in the right middle section. We have a special monitor set up that those with hearing loss have found very helpful. Do I have to register to use this site? No, you do not need to register. You may wish to sign up for the weekly e-newsletter to learn more about us. You may safely unsubscribe at any time without hassle. Prayer cards are available at our weekly gatherings. Ushers will collect the prayer cards and bring them to the Pastor who will include them during the prayer time of the worship service. Prayer requests are also emailed to our prayer team and posted on our secure Facebook page for our prayer group. Not yet, although that certainly is our dream and long-range goal. We pray for God’s guidance concerning the timing and location of a building. We know that we are the church as a body of people who love Jesus and love serving our neighbors with or without a building. 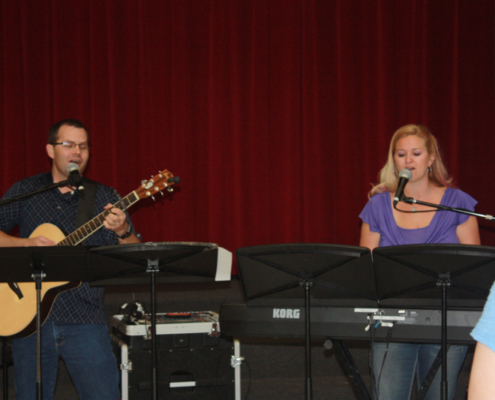 Music in worship features contemporary praise songs led by the Spirit Song Praise Band. 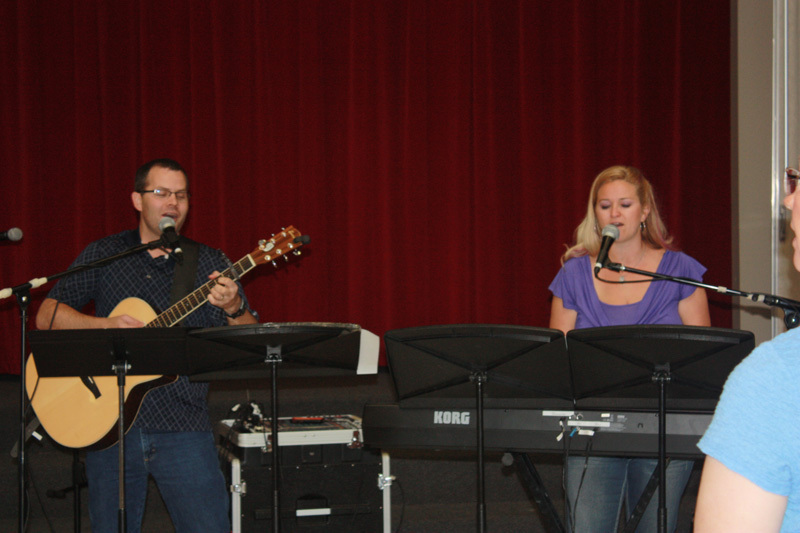 Pictured are worship leader Keslie Halonen, husband Nick Halonen on guitar, and Robert Anders on drums.